Born in Turin in 1909, Rita Levi-Montalcini graduated in Medicine at the Institute of Anatomy, University of Turin. Since her first years in college, she focused on the study of the nervous system. Following the promulgation of racial laws, she moved to Belgium (1938) in order to carry on her research on the processes of differentiation of the nervous system. During the war, she took refuge in the area of Asti and then hid in Florence, under a false name.. 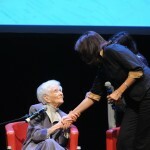 In 1947 Rita Levi-Montalcini was invited to the Washington University in St. Louis, Missouri. In 1951 she travelled to Brazil to perform experiments on in vitro cultures at the Institute of Biophysics at the University of Rio de Janeiro. At the end of that same year, in December, such research brought her to the identification of the growth factor of nerve cells (Nerve Growth Factor, known by the acronym NGF). In the winter of 1953, as Rita Levi-Montalcini returned from St. Louis, a young biochemist joined her work, his name was Stanley Cohen. Using the in vitro system that Rita Levi-Montalcini had designed, Cohen identified a tumorous protein fraction capable of stimulating the formation of the halo fibrillar around ganglia cultured in the vicinity of tumor fragments.. In 1969, Rita Levi-Montalcini definitely moved back to Italy and became the director of the Institute of Cell Biology of the CNR in Rome, covering the position until 1989. The discovery of NGF earned her the 1986 Nobel Prize for medicine. 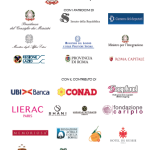 From 1993 to 1998 Rita Levi-Montalcini chaired the Institute of the Italian Encyclopedia Treccani. She has been a member of the most prestigious national and international scientific academies such as the Accademia Nazionale dei Lincei, the Pontifical Academy of Sciences, the Academy of Sciences also known as the XL, the National Academy of Sciences and the Royal Society. 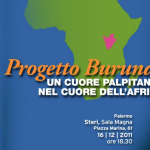 She was honorary president of the Italian Association against Multiple Sclerosis. Rita Levi-Montalcini put effort into the scientific field as well as in the social, through the activities of the Rita Levi- Montalcini Non-profit Foundation which she chaired. 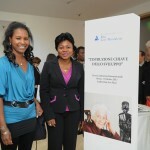 The Foundation's main goal is to help young women from African countries by supporting their education at all levels. On August the 1st, 2001 she was appointed senator for life. 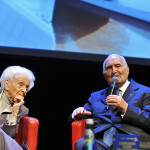 In 2005 she founded the European Institute for Research on Brain, under the acronym EBRI (European Brain Research Institute), which she chaired. The EBRI aims to carry out research in the field of neuroscience. 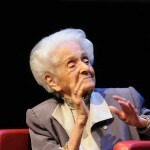 Rita Levi-Montalcini died on December the 30th, 2012 at the age of 103, at her house in Rome, in Viale di Villa Massimo. Her funeral was held on December 31st at the Italian Senate and her body was moved to Turin on the following day. After the cremation, her ashes were buried in the family tomb at the Hebrew Monumental Cemetery of Turin.